Guardian Spies: The Story of the U.S. Coast Guard and OSS in World War II - "Operation Cincinnati"
"Operation Cincinnati" was a full scale exercise conducted by Maritime Unit (MU) Operational Swimmer Group 2 (OSG 2) just after completion of team training in Nassau, Bahamas to test the harbor defenses of the Navy in Guantanamo Bay, Cuba and the Caribbean Theater. In addition to testing Navy defenses, these "exercises" were designed to test the effectiveness of the new Operational Swimmer Groups ability to conduct infiltration and sabotage operations by sea against an enemy before they were to deploy to the China, Burma, India Theater in the Fall of 1944. 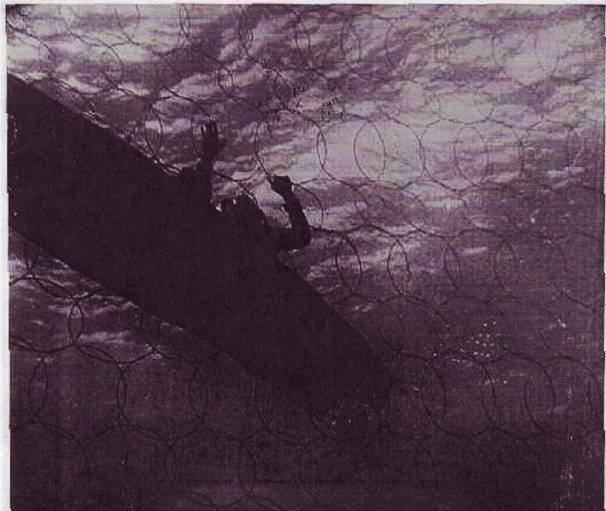 These "exercises" designed to test the effectiveness of Navy defenses were the first of their kind in the maritime environment and became the foundation for what would later become "Red Cell" operations conducted by U.S. special forces and teams. Modern "Red Cell" operations are designed to test the effectiveness of security procedures, tactics and personnel. Although it is widely thought that the first "Red Cell" team was created by U.S. Navy SEAL Richard Marcinko, Commanding Officer of SEAL Team Six, in 1984; in fact the declassified records from the Office of Strategic Services Maritime Unit and Kermit Roosevelt's assessment of them in the "War Report of the OSS" indicate that OSG 2 conducted the first such operations . 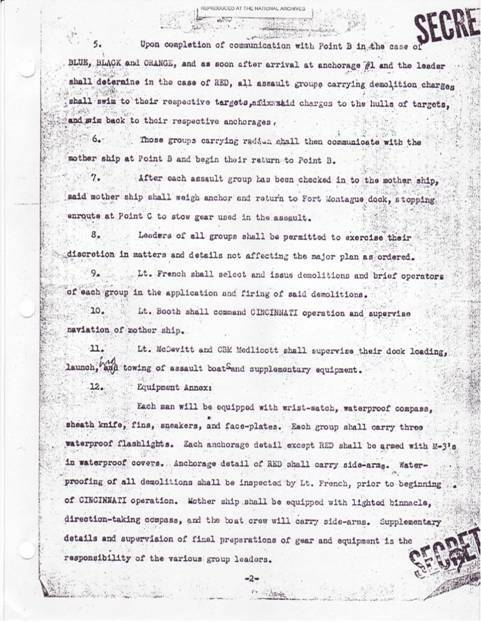 These MU Operational Swimmer Groups were initially designed and organized to conduct covert, sabotage, and espionage operations against the enemy. "Operation Cincinnati" was an attempt to infiltrate and otherwise test the security of U.S. Navy defenses in GITMO almost 40 years before the Navy commissioned Commander Marcinko to set up Red Cell teams in 1984 in order to test the Navy's vulnerability to terrorism. 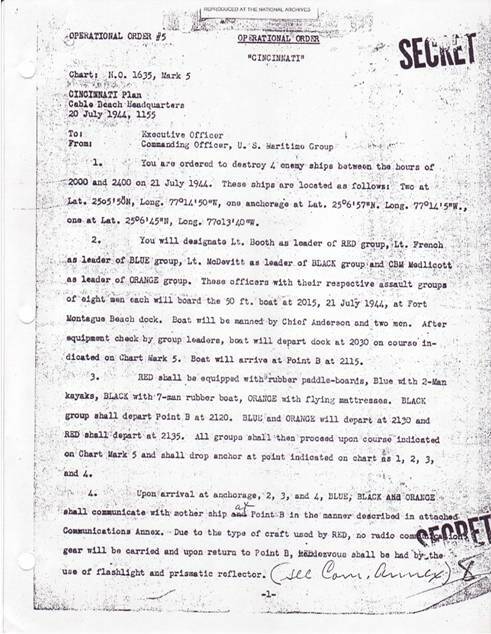 LT John Booth (USCGR) was designated as leader of the "Red Group" (see declassified OPORDER on the right) and placed in command of the operation and entire "assault group" to include the mothership. Roosevelt, Kermit. 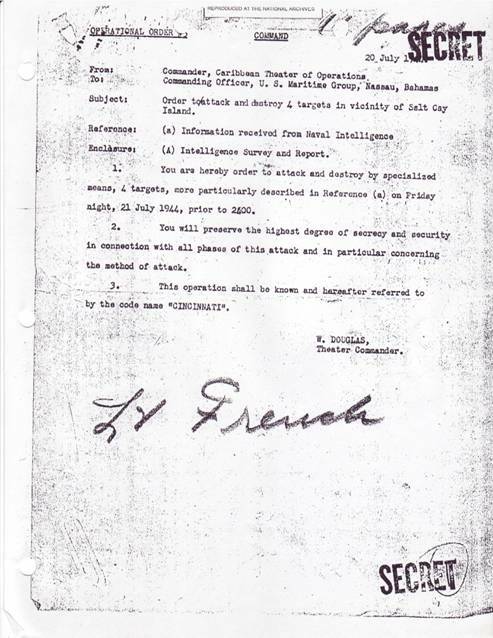 War Report of the OSS.